(This is Part 3 in my Preschool Series. Click here for Part 1: Language Arts or here for Part 2: Math and Science). I want to start out by addressing the issue of me being a Catholic parent who uses Sonlight. I truly believe that as homeschoolers and as parents, we are called to fill our homes and the eager little minds of our children with all things that are good, beautiful, and true. That does not mean that Protestant or secular materials cannot be those things; nor does it mean that all things labeled Catholic are those things. We must be wise consumers when it comes to choosing materials. After much research, I felt that Sonlight’s early programs (I cannot speak on behalf of their programs for older elementary and up) were simply filled with rich literature and Christian based activities. I have found that it is easy to substitute Catholic materials for some of their reading recommendations as well as any Bible lessons that I feel need supplementing or replacing. It really has not been an issue with this early of an age. There is also an excellent Yahoo! group called SL Catholic that is worth joining if you’re considering using Sonlight but want to make appropriate Catholic substitutions. With that in mind, I’ll now address Religion. Sonlight’s Pre-K 4/5 program does have a Bible section, which we sort of use. I love the idea of a Bible verse each week (but I do look up each verse in my New American Bible), so we use that. I introduce the Bible Verse on Monday morning and we continue to practice that particular verse first thing each morning. We also practice our previous weeks’ Bible verses. I hope to infuse these boys with God’s word so that it becomes common practice to have those words dancing around in their heads. We’re using the Family Time Bible in Pictures from Sonlight’s 4/5 program as well. I like the simplicity of each story and I haven’t found a “Catholic” version quite like it yet (but I’m open to suggestions if you know of one!). I’ve found a Catholic Bible for younger kids that I like as well as one for a little bit older children with longer stories, but I just haven’t stumbled across a Catholic Edition with the same length of stories as this particular bible. We read a Bible story each day Tuesday through Thursday and use any appropriate felt board stories or other hands-on tools that we have (we have a great set of figurines that we use often to act out stories). 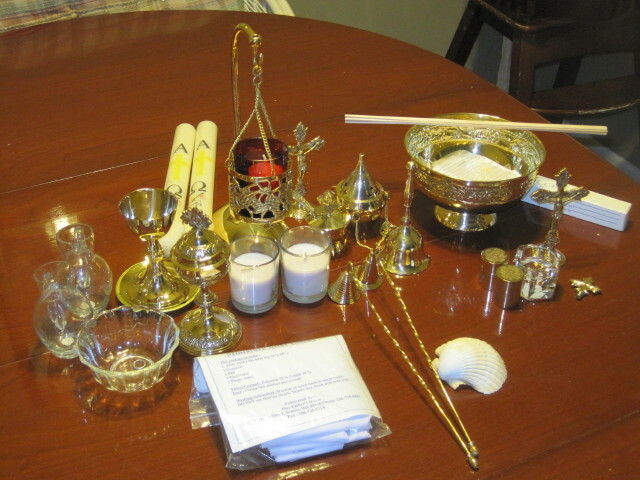 After our Bible verse and story, we spend some time at our prayer altar. 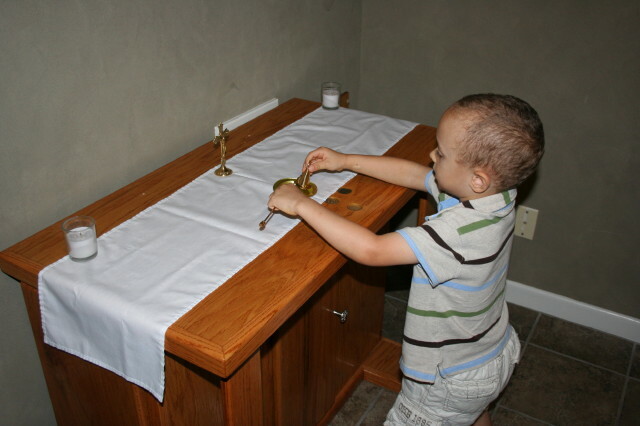 Joseph has a few particular prayers that he likes to pray daily, such as his Jesus prayer (Dear Jesus, I offer you today, all that I think and do and say) and the Memorare. Then we let the Holy Spirit guide us. Sometimes we say some more prayers. Sometimes we read a story about a saint. Sometimes we choose a book about God. I lightly use Catholic Mosaic (when I say lightly it’s only because Joseph isn’t quite old enough to really use the program as intended, but it is a beautiful program that I intend to use throughout our schooling years…if you don’t have a copy, I’d highly recommend it) to guide us through the Liturgical year. 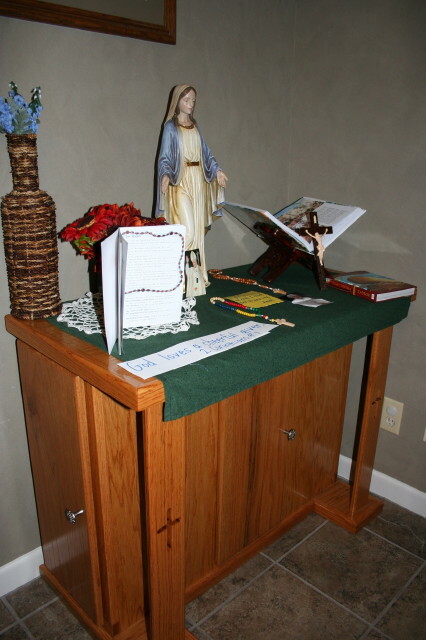 Since our prayer altar was custom built (thank you Grandpa Gary), it has an entire cabinet beneath the table that holds all of our religious books and many of those books are Catholic Mosaic choices. While it may be a bit costly, I highly encourage you to consider purchasing (instead of simply borrowing from the library) many of the Catholic Mosaic books. They are books your family will read time and time again, year after year. Just a little side note about including even the littlest ones in our religion lessons: William always joins us during our prayer time. No exceptions. If, however, he is not interested in the day’s lesson, he’s always happy to browse through the shelves of books or play with our figurines while Joseph and I follow our lesson. I find it remarkable that somehow both children understand that our prayer time is a special time in which to pray and learn about God. They know to use quiet voices and to show respect for our prayer area. 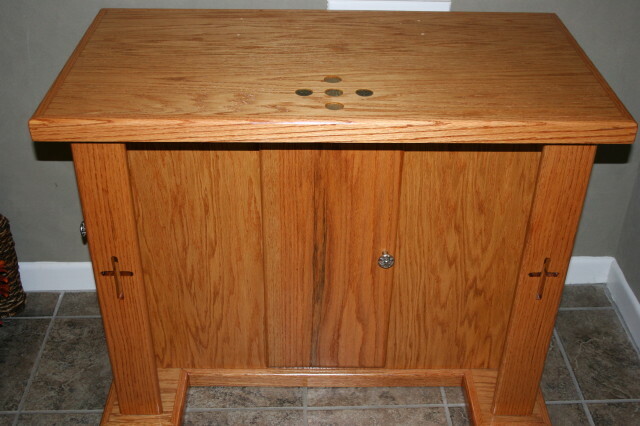 Our prayer altar actually holds a double purpose. It is also our home atrium. 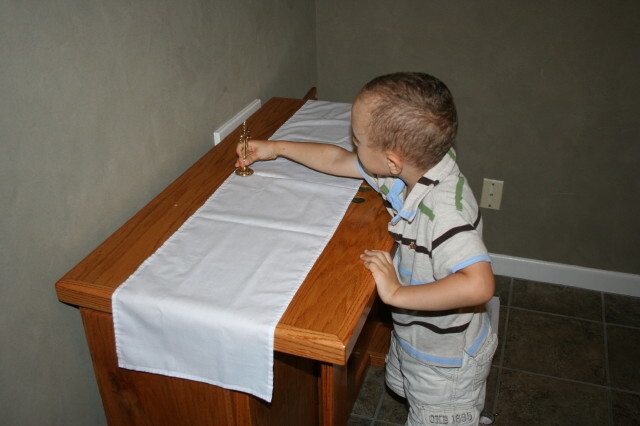 Do you know about the Catechesis of the Good Shepherd? I’m not brave enough to try to summarize the theory behind it so I encourage you to either contact your local parish to see if it is offered near you so you can visit an actual atrium or to take some time to browse the Catechesis of the Good Shepherd’s website. There are also many excellent books written about the subject such as The Religious Potential of the Child and The Good Shepherd and the Child. I was first introduced to an atrium when I taught at a local Catholic school. It was, by far, the absolute most beautiful, peaceful, and effective method I had ever seen employed to teach children about Jesus. Not only does the atrium teach necessary catechetical information, but more importantly it helps the children develop a real relationship with Jesus. As a guide, I use Moira Farrell’s Home Cathechesis Manual. It’s very well done. 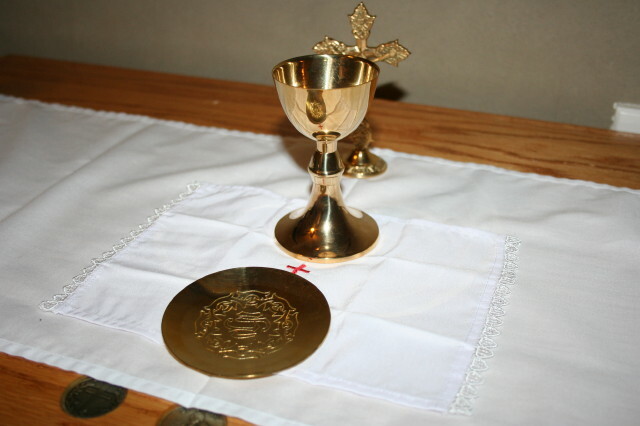 We also have the Mass Kit and the Baptism Kit, which are available from Our Father’s House. For fine arts, we’re using a few little treasures. Joseph’s learning the piano this year, with the help of Beethoven Bear and Mozart Mouse through a program called Music for Little Mozarts. We’re still in the beginning of this program (book 1) so I cannot tell you how effective it is (yet) but I can tell you that Joseph finds it very exciting and if nothing else, it certainly has sparked in him an interest for learning to play the piano. For music appreciation, we’re using Making Music, Praying Twice. It’s kind of a Catholic version of Kindermusic and while it was a little pricey, I definitely think it’s worth the investment because it’s a music appreciation course that can be used from birth to age 8. We’re having a great time. The music CDs are so well done…they’re now our top pick for listening to in our free time! We’re doing six weeks of music, followed by six weeks of art. For Art, we’re using ARTistic Pursuits for Preschool. What a gem! For art appreciation, we’re alternating between Art Memo (a memory game with famous paintings…such a simple way to introduce the masters) and Mommy, it’s a Renoir. And for art projects on rainy days, I use First Art by Mary Ann Kohl. This book allows even William to participate without having to make any adaptations for his age. We’re still doing the same thing we did last year with regards to languages. Grandma Nury comes once a week to work on Spanish. They play games, draw pictures, have conversations. It’s really quite beautiful. (Yesterday, he was excited to discover that our friend Ingrid can speak Spanish, too!) We’re still doing one lesson a week from Prima Latina, although obviously we’re not using the workbooks. 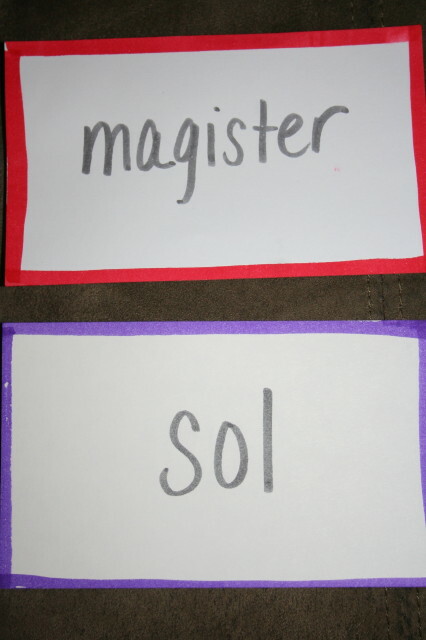 We just simply introduce the words and put them on flashcards, which we then practice from time to time during breakfast. We’re just building a simple Latin vocabulary. To keep ourselves from getting confused between languages, we use a simple method for our flashcards. All Spanish flashcards are outlined in purple. Latin are outlined in red. Simple but effective. That is great and I love the pictures. I have to get busy on the vestments don’t I? stacie – this is wonderful – wish we lived next door! i am so happy for your little family. 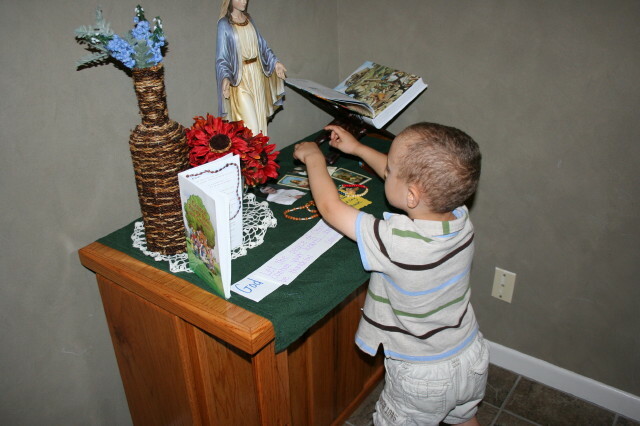 I used the Little Saints program last year with Joseph and I loved it! The only thing was that I found it a little parent intensive with all of those manipulatives that had to be made. We had a lot of fun with it, though, and I still pull stuff from it all the time! Thanks for the suggestion!